Unlike today, U.S. minted coins from the late 1700’s through the early 1900’s had essentially the same design across most denominations. As an example, the Capped Bust coinage introduced by the Chief Engraver of the Mint, William Kneass, included not only the half dollar and quarter, but the dime and half dime as well. Even the large cent and half cent denominations had a very similar design. Perhaps the most popular coin in the Capped Bust design was the Capped Bust quarter which was produced for circulation from 1815 to 1838. At the time, the government specification for silver coins stated that the coins should be 89.24% silver and 10.76% copper which is the composition of the Capped Bust Quarter. 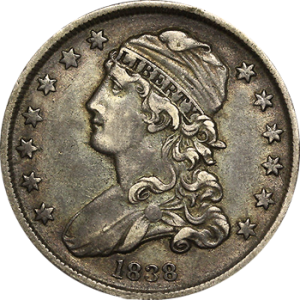 While the silver composition and the weight (6.74 grams) stayed the same throughout the production run, the diameter of the Capped Bust Quarter changed in 1831, going from 27 millimeters (1815 – 1828) to 24.3 millimeters (1831 – 1838). The two types of Capped Bust Quarters are known as “Large Diameter” and “Small Diameter” or “Motto Removed” since the motto was eliminated to reduce the overall diameter of the coin. With a smaller production run, the large diameter Capped Bust Quarters usually command a higher premium than the smaller diameter. Due to demand and circulation, even though the Capped Bust Quarter was produced from 1815 through 1838, it was only minted in 19 of those years. With an overall mintage of just under 5.5 million coins (just under 1.3 million “Large Diameter” and 4.2 million “Motto Removed” or “Small Diameter”), most Capped Bust Quarters run about 5x over silver spot value with exceptions. Perhaps the most notable exceptions are the overstrikes including the 1823/2 overstrike (starting in the $20,000 range for MS60) and the 1827/3 overstrike (starting in the $110,000+ range for MS60).